For South African film director Ralph Ziman, growing up in Johannesburg meant guns were a fact of everyday life. Some might say little has changed. Weeks of testimony at the Pretoria trial of Oscar Pistorius have – among many things – shone a spotlight ongun culture in South Africa. Witnesses spoke of several incidents in which the Olympic athlete thought little of drawing a gun in public and firing – once at a restaurant, once through the sunroof of a car. 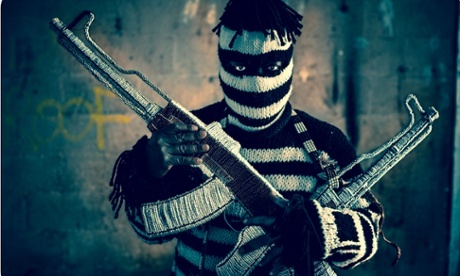 Ziman says it is “South Africa’s continued obsession with guns” that inspired him to create Ghosts, a project documented in a new exhibition of striking photographs which opens in Cape Town this week. The reverence of guns is not limited to South Africa. 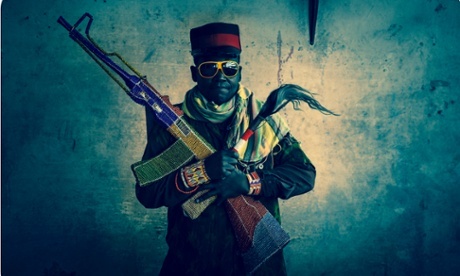 Ziman says the AK-47 is “loved, revered, and fetishised” across Africa, despite being at the heart of bloody conflicts. 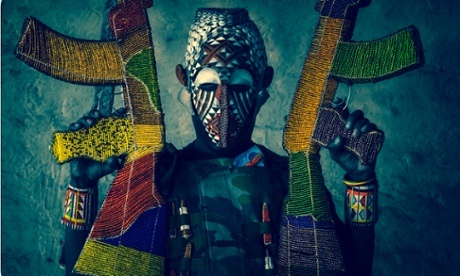 The title of his exhibition, Ghosts, refers to those killed by the weapons, as well as those who traffick them. 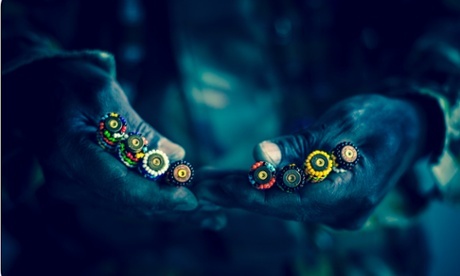 Ziman says he had always loved the brightly-coloured beaded tourist trinkets made by men at the side of the road in Johannesburg. Last year, driven by the idea for Ghosts, he stopped his car one day and approached some of the craftsmen, asking them to make him a replica of a Kalashnikov. Ziman shipped the replicas, plus around 1,000 hand-crafted rounds of fake ammunition, to Los Angeles, where they were auctioned to raise money for Human Rights Watch and Control Arms. “I like to see it as a sort of reversal of the arms trade,” he says. 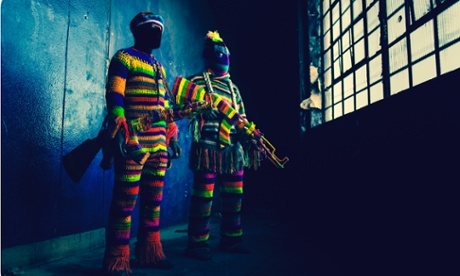 Back in South Africa, the pictures that will appear in the Ghosts exhibition feature the craftsmen with their fake weapons, posing in downtown Johannesburg. The men – Boas Manzvenga, Panganai Phiri, Lenon Tinarwo, Telmore Masangudza and Kennedy Mwashusha – are originally from Zimbabwe and will fly to Cape Town to attend the opening on Thursday (“their first time to Cape Town, and their first time in a plane,” says Ziman). Most of the reaction to the pictures has been positive, but isn’t Ziman worried he is only reinforcing the “fetishisation” of guns with these images? With the verdict in the Pistorius trial expected before summer, Ziman acknowledges the exhibition comes at a sensitive time. Posted on 24th April 2014 by newsafrica. This entry was posted in Africa, Arts, Headlines, South Africa, Zimbabwe and tagged Africa, AK-47, Cape Town, Johannesburg, Los Angeles, Ralph Ziman, South Africa, Zimbabwe. Bookmark the permalink.